If you have a four wheel drive vehicle, odds are you’re going to need to have a transfer case repair done sooner or later. Whether or not you should replace the case or repair it depends entirely upon the cost of both options. What Does Such a Repair Cost? Look at it this way. You’re investing, not spending. Your car will give you hours of convenience and pleasure, but only if you take care of it. A lot of people opt for preventative maintenance instead. Continued maintenance of a vehicle, like a transfer case repair and service reduces the risk of a very expensive breakdown later on. In a four-wheel drive’s differential and transfer case, there are dozens of smaller component pieces. A transfer case is a complex unit. You have to decide whether to repair it or replace it. What Options Do I Have With My Transfer Case? You can replace your transfer case, or if the issues are small, repair the transfer case. A new transfer case has the advantage of reliability with a full manufacturer’s warranty on it. It also has the advantage of generally being more reliable over the long term life of the vehicle and less likely to break down for years to come. I’ve Heard About Rebuilt Units, Are They Any Good? Rebuilt transfer cases are another option. Be aware however, that while a rebuilt case is cheaper, and some of them are perfectly fine, some other rebuilt cases are essentially high-priced junk. Make sure that there is some sort of warranty on your rebuilt unit, like the one that Trail Transmission offers, or that the unit is factory-certified to avoid being disappointed later. At Trail Transmission, we back all of our transfer case rebuilds and repairs with a solid warranty that provides peace of mind that you’re covered if anything goes wrong. 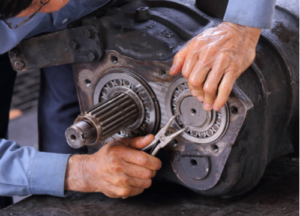 Since 1990, Trail Transmission has been your experts with transfer cases, differentials, and transmissions. Give us a call at (480) 986-7367 and let us show you what we can do for you.